We all have albums that, over repeated listens, seem to embed themselves in our very marrow and press themselves upon our DNA; certain melodies and lyrics from them become a sort of haunting comfort when our heads hit cold pillows after bad days that seem to have no end and carve out a path in the gray matter of our brains. Bell Witch’s Longing is one of those albums for me. The Seattle duo’s cavernous, noticeably dirty take on the funeral doom sound had me rapt at first listen, and their debut was on constant repeat during some very trying and draining circumstances in the months that followed my discovery of the band. I say that to say that it’s nearly impossible for me to be totally objective with this review; with an album that has so many memories attached, how could I even begin to approach a follow-up that is a blank slate in terms of its connection to me as a listener? I’ve been awaiting the arrival of Four Phantoms for months and knew that if it was even remotely close to the desolate, mournful sound of Longing, it would be another monumental achievement. Like any doom metal album, my first few listens of this were filled with criticisms and the “hour long song” syndrome; but I stayed persistent and kept digging, peeling back the dense, foggy layers of this album to discover a gem of metal that is in line with the band’s debut but far more expansive and ambitious. Four Phantoms is by no means an easy listen: With two of its songs totaling nearly 45 minutes and the remainders accumulating another 20 minutes, Four Phantoms takes its toll on the listener, both in the way of initial patience and how the Bell Witch’s compositions can chip away at the listener’s emotional well-being and leave a sullen, empty shell of a human by album’s end. Four Phantoms’ theme is centered around an eternal process of dying: Each song and its lyrics represent a ghost (phantom) who is caught in an endless cycle of death by one of four elements (earth, fire, water, air). I won’t divulge all the details (you can read here), but it’s a brilliant (if terrifying) concept and is perfectly united to the movements of the music across its four sprawling tracks, creating all too vivid portraits of torment, despair, and agony. The album starts with “Suffocation, A Burial: I – Awoken,” a 22-minute journey that displays the band’s keen ability to, even across a multi-movement song, maintain a constant sense of momentum without sacrificing atmosphere. Immediately upon listening, it’s apparent that Bell Witch have fused the best elements of their quiet, eerie ambience with glacial slabs of funeral doom, that, while executed well on their debut, are more sophisticated and climactic here. The third track, “A Drowning,” becomes nearly uplifting from the 6:00-10:00 mark as clean chants cascade over what is possibly the best bass melody the band has written in its career before diving into a descending minor key figure that drives remaining sections of the song. The duo transition seamlessly from sparse, echoing chords into earth-shaking distortion and bass leads that go far, far beyond the description of “sad music.” The two tracks that comprise “Judgment” (“Garden [Of Blooming Ash]” and “Felled [By Howling Winds] are shorter and, while not as climactic as the “Suffocation” tracks, still show a natural progression from Longing with melodic figures that seep into listeners’ minds while Adrian Guerra’s pained growls erupt from the mix like heretics under the curse of Hell. 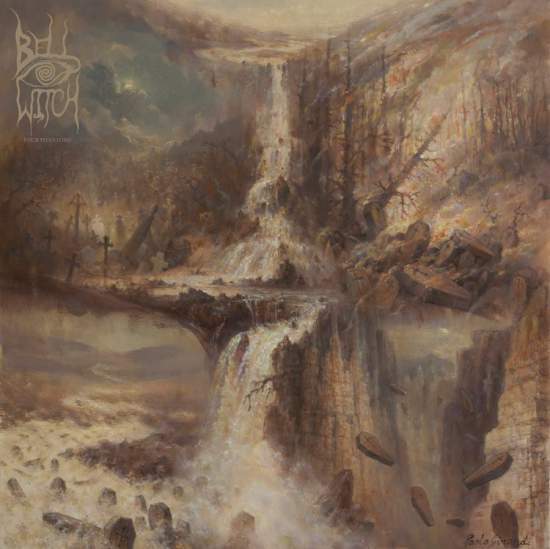 To say that this music is fueled by despair is putting it very lightly; if Bell Witch’s aim was to capture the horror of death and the apprehension of eternity, none have done it better. The production, far louder and denser than Longing, seems to be more an aesthetic choice to enhance the atmosphere of suffocation and the dread of death. At first, I was put off by the lack of dynamics in the mix, but as I’ve repeatedly listened to Four Phantoms, the unrelenting loudness of the album serves the band purposes well and still maintains a fair balance between the layers of bass, drums, and vocals. Four Phantoms is not for everyone. If anything, its appeal is extremely narrow, and those willing to venture in will be exhausted and emotionally drained by its unflinching gaze into the darkness of death and the uncertainty of everything that accompanies it. It is an album that will truly take a piece out of you; it does not easily let listeners go from its clutches, and long after the playing time is over, it’s impossible to not be impacted by a work of such magnitude and profound despair. This is far beyond the album that Longing was, and it may well be one of the most emotionally difficult albums I’ve ever encountered. Tread lightly. Four Phantoms is now available through Purcvhase Bell Witch’s Four Phantoms Profound Lore Records digitally and on CD. The vinyl will be available soon.